There are a few things good to know before you should head into wedding venue selection. 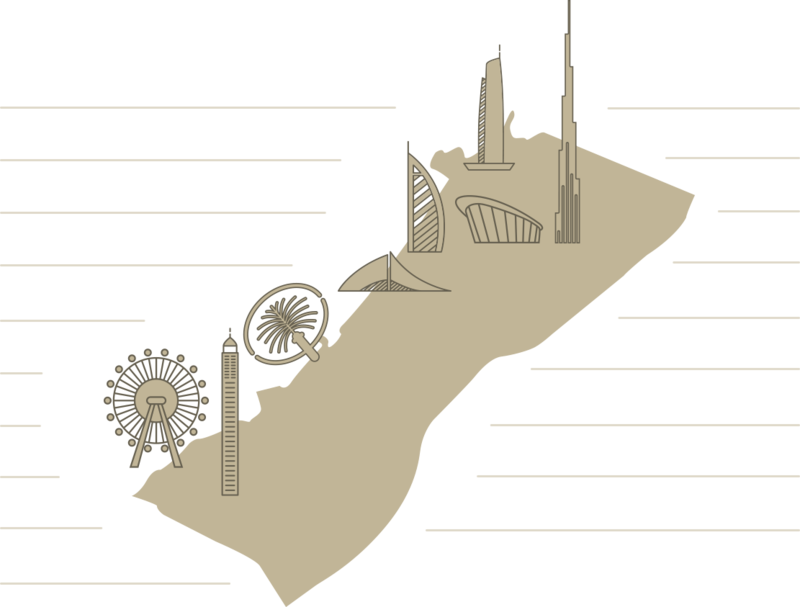 There are plenty of indoor venues and a handful of outdoor venues in Dubai. Venues that offer both options, indoor and outdoor are much more rare. Especially if you want the two venues to be right next to each other. Although the weather is good all year around and it is hardly raining more then 4 times a months evening in the rainy months, you still need to be able to prepare for plan B. In which case your outdoor venue will need to allow for a tent structure or an indoor option should be available. 1. Most couples prefer to come to Dubai for it’s white sandy beaches. The best time for an outdoor wedding is between November till April, when the average temperature is below 30 degrees. 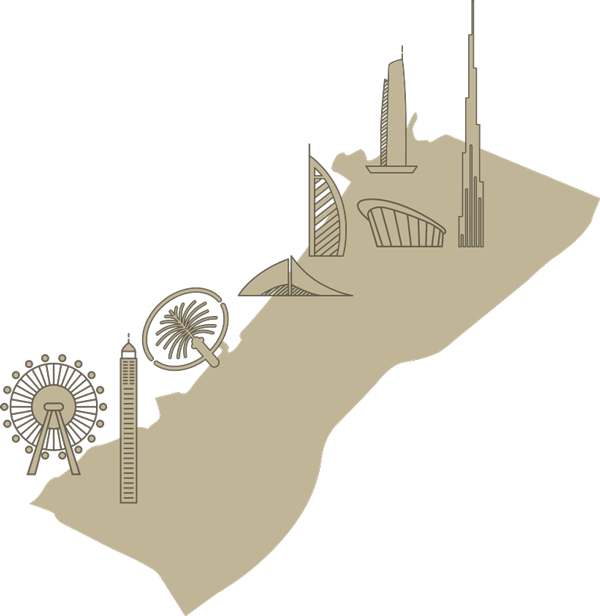 Areas preferred for outdoor venues are Jumeirah Beach, Palm Jumeirah or the Jumeirah Beach Residence. 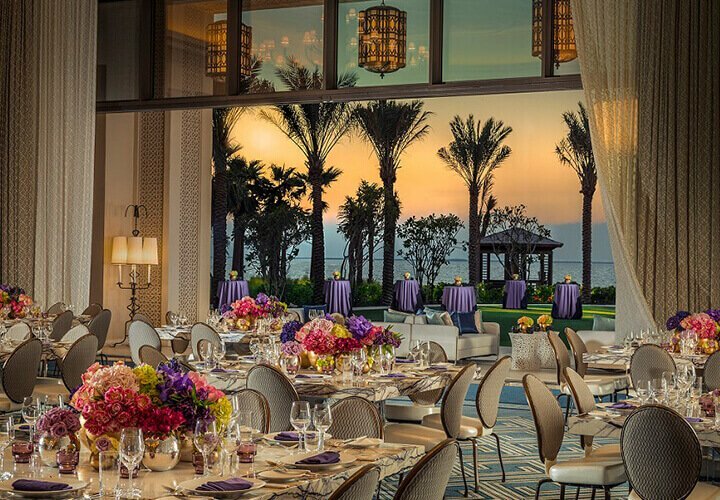 In Dubai 5-star hotels dominate the wedding venue market. There are close to a hundred hotels offering wedding services. Out of these there are only a handful which truly defined as a wedding property. 2. These ones will typically have multiple venues both indoor (ballroom) and outdoor (lawn area) and a poolside venue where pre- or post-wedding functions can be organized. Hotel developments are continuously taking place so there is always something to be excited about; there is always something new. The opera house opened its doors in 2016 and offers its services for weddings as well. There are more and more polo clubs and desert resorts which will give you a different experience, all set in a luxurious. 5-star environment. In case you are looking to invite a thousand or more guests and planning to build up a unique concept, decor and stage – than there is the World Trade Center. 3. In case you are thinking about an outdoor option, then plated menus are more had to facilitate due to logistics and distance. Better to go for the buffet menus. Depending on what you would like to have exactly on the menu, you are looking to spend around 250-300 Dhs / person on the menu. Most of the venues do wedding packages that includes – buffet, soft drinks during the dinner, three tier wedding cake, small centerpieces, basic audio system (for background music) with 1 microphone and the dance floor. Plus a complimentary 1 night in a Suite for the wedding couple. However if you want wedding packages, the venues will require a minimum of 100-150 guests in order to be able to offer the complimentary items. 4. Consider that you cannot have a wild party outside, and the music has to shut down at 11 PM by the law at almost all venues. Some venues allow to have background music until 12 or 1 AM. There is an exception to this, which is the Mina a’Salam, Fort Island – where you can have a live band or DJ performing as long as 2 AM. If you consider an indoor wedding, with lavish decoration, bear in mind that you also need to have a previous day for the set-up which can also have an additional cost. Indoor weddings must be finished by 2 AM, this is controlled by the government. Some of the venues can make an exception, but that depends on weather we get the permission from the local authorities or not. 5. Since UAE is a muslim country expect that alcohol is a lot more expensive than anywhere else in the world. Also alcohol is only available with venues that have an alcohol license – that is typically 5-star hotels or high-end event venues. There are at least 4 types of alcoholic drink packages. The basic package is including only house wine and beers. The next level is including medium level sprits and sparking wine. The third level has typically has the premium spirits and french Champagne as well. 6. Indian and Arabic weddings require special buffet dinner menus with live stations – and a lavish selection, while Western type of weddings more prefer the three to five course seated meals. Venues usually don’t prefer outsourcing the alcohol, but it can be evaluated based on the final total revenue of the event. In case it is allowed than there is going to be a corkage fee, either paid by the bottle or a flat fee that is calculated based on the expected consumption. Most wedding venues do not have rental fees but they require a minimum spend. 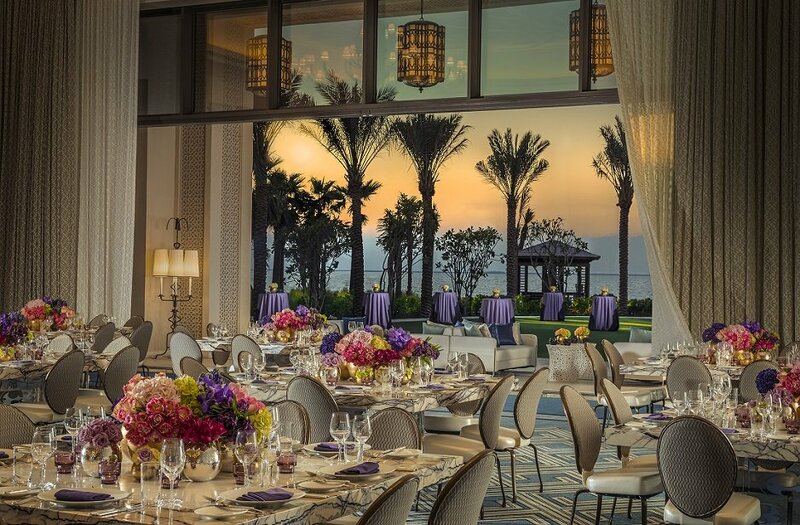 This can be as little as 20.000 Dhs, with venues than can accept 150 – 350 guests you are looking at around 100.000 Dhs, while the premium venues will ask for more than 150.000 Dhs. Depending on the total revenue brought to the venue this can be subject to negotiation. Minimum spend can be consumed on canapés, buffet menu, drink packages – any food and beverage items basically. 7. Getting quotations from hotels can be a lengthy process, in case events is not your full-time job. First you call to the hotel and get connected to the call center. There are about 10-20 people working on the sales department so they will try to find out what you want exactly in order to get connected to the right person. Sometimes language can be a barrier even tough you are both speaking english. Be prepared if you have a wedding that’s including hotel rooms booking than you will usually speak to a different person than if you only have a wedding without rooms. 8. Once you got connected to the right person then you start all over again as they will want to know the briefing of your event before they ask you to send it in an e-mail as well. Hotel policy is to get back to you within 24 hours, which is not always happening. If some information is left out of the reply than expect an other 24 hours for the additional pieces to come together. Now multiply this with 10-15 venues that you are looking to consider. We know all the right persons to contact in the wedding business, so in case you decide to work with us, then you can expect a proposal within 24 hours including starting prices for food and beverages.